Squirrels are relatively harmless, but if in a situation where you need to keeps squirrels away there are a few good humane ways to do so. When thinking about keeping squirrels away the main purpose is probably to keep them from ruining your garden or flowerbeds. Amazon has a large variety of ways on how to keep squirrels away. The top five ways to accomplish keeping these rodents away are; Scent based repellent, Ultrasonic sound, Motion activated water sprinklers, foods that squirrels detest, and garden cages. Plantskydd is a great way to keep squirrels away from your garden and surrounding area. This is an organic small critter repellent that lasts year-round and is safe around your vegetables and other crops. The entire 7-pound bag can cover up to 4200 square feet, which should be plenty for your house. The bag is extremely easy to use, the re-sealable hole on the bottom of the bag allows you to sprinkle the repellent easily and evenly. There are even great reviews on amazon suggesting that after even 13 months after using Plantskydd the garden remained squirrel free. Ultrasonic sound is also a great way to keep squirrels from getting at your garden. The T3-R as seen on amazon uses a frequency of 135 decibels to stop squirrels from wanting to come around. This device is inaudible to humans, dogs, and cats. The unit claims to work within the first 1-2 weeks. The only drawback of the T3-R is there’s only a 6-foot cord, so for it to reach your garden an extension cord might be required. The T3-R is rain resistant but should still be used under a shelter, a small tarp would suffice. Reviews for this product are minimal but the money back guarantee is something that the customers will respond well to. Probably one of the more humane ways at keeping squirrels and other rodents away from your garden are motion activated sprinklers. The Contech CRO101 Scarecrow is an amazon #1 Best seller. This sprinkler system will briefly target any critters whether they were invited or not, meaning if you have a pet that goes around the garden frequently they will get wet. This unit has a range that covers up to 1000 square feet, uses a 9-volt battery and also comes with a two-year limited warranty. The small squirt of water is powerful enough to keep pests away but not strong enough to cause any physical distress to the pest. This product also will help your garden by occasionally squirting water on it and keeping the soil wet so the garden can grow nicely. Squirrels love sweet corn. 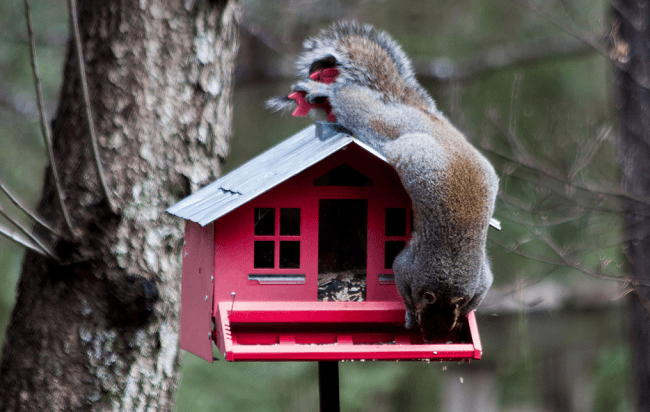 A strategic way to possibly keep squirrels away is to place feeders around the grounds to keep the squirrels attention on them instead of on your garden. This might be a risky way because there is no way of telling if the squirrels will actually take the bait. An amazon product such as Wagner’s Cracked Corn is available for a good price and the product attests to the fact that squirrels “love this stuff.” An alternative method to this is to get foods that squirrels absolutely hate and sprinkle them around the garden squirrels will remember eating these foods and will keep clear of them and their location when they go searching for food the next time. If the sensory methods above fail to peak your interest then maybe garden cages/netting will be something to consider. Before you start you should know that normal fences will not work considering squirrels are excellent at climbing and could easily still get into your garden. Instead you would need a fully enclosed method. This method is extremely successful at keeping animals out of the garden but may bother the gardener as they will have to make their own way in and out. Consumers agree that this is an effective way to keep all pests away, netting is a thin material that may tear easily, therefore you must use with caution and check every once and a while for holes and tears. In conclusion if you are looking how to keep squirrels away there are a number of humane ways to do so. Through Sensory methods such as scent based repellent, ultrasonic sound, motion activated sprinklers, and tastes that will attract squirrels away. Or a more physical method of actually building a fence/ netting to keep them away amazon has everything you are looking for and at a cheap affordable price.